Shyanne Chisum gets into a comfortable position before the SARA 2.0 technology that she is helping to test is used. Oct. 11, 2018 | Hari Eswaran, Ph.D., and his research team are working hard to see if a new generation of technology can improve on a device developed at UAMS while lowering its cost and benefitting pregnant mothers. 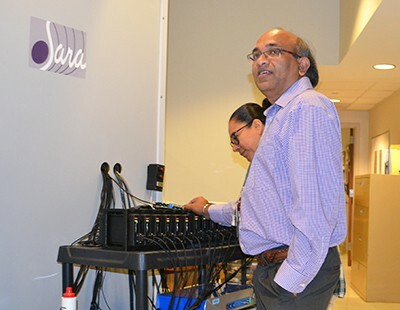 In 2000, Eswaran was part of the UAMS team that developed the SARA (SQUID-Array for Reproductive Assessment) device for maternal-fetal medicine research. 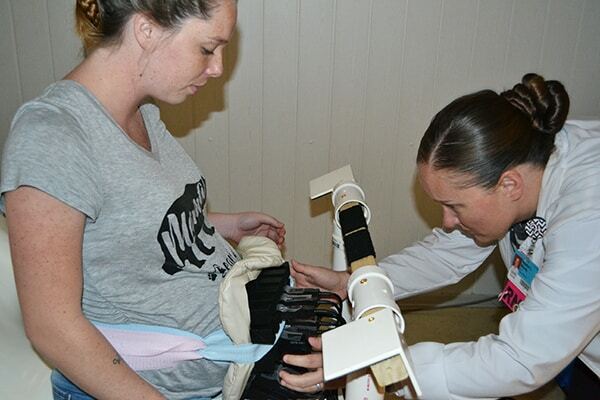 When the SARA is used, a pregnant woman sits against a concave shield that covers her abdomen. Heather Moody, R.N., adjusts and places the SARA 2.0 array on Chisum. More than 100 sensors obtain three-dimensional data from the fetus and the uterus – without employing needles or any other invasive instruments. Advanced techniques with the SARA allowed for the simultaneous examination of cardiac and brain activities in the fetuses. Eswaran, Ph.D., is a professor in the College of Medicine’s Department of Obstetrics and Gynecology. Along with Curtis Lowery, M.D., Heather Moody, R.N., a certified research specialist, and Diana Escalona-Vargas, Ph.D., Eswaran has been working with QuSpin, a company that has developed a new type of sensor that might be a viable replacement for the original SARA. Lowery is chair of the Department of Obstetrics and Gynecology. Moody and Escalona-Vargas work in the department’s Division of Maternal-Fetal Medicine. Instead of more than 100 sensors, they have been able to use a grid array of 14 sensors that can be strapped to the mother’s abdomen. Where the original SARA cost almost $2 million to construct, each sensor in what Eswaran and his team are calling ‘SARA 2.0’ costs $8,000 to $10,000, a potentially huge savings. 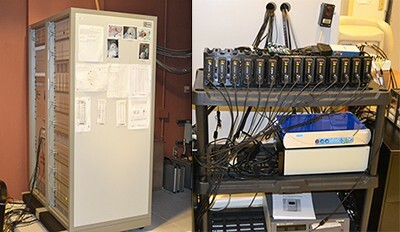 The first SARA, left, is much larger and more expensive to operate and maintain than the new SARA technology, right, being tested at UAMS. That savings means the new technology might one day be an affordable diagnostic tool in hospitals for use with pregnant mothers. The cost of the original SARA has meant it has primarily been a research tool, one only available at UAMS and another research facility in Germany. In late 2017, UAMS received a two-year, $275,000 grant from the National Institutes of Health to study the effectiveness of the new technology and what might be the best position for the mother to get a good signal from the device while also improving her comfort. So far, the reviews from at least one pregnant mother have been positive. Chisum volunteered for the study about 28 weeks into her pregnancy. When she came to UAMS recently on a September morning for her fourth round of scans, she was at 35 weeks. By volunteering, she also was able to receive 3D and 4D ultrasound imaging of her baby, something she wanted to have. Hari Eswaran and Diana Escalona-Vargas make some technical adjustments to SARA 2.0 before a test. The research team also has tried using the device while the mother is leaning back in an Adirondack chair. Next, they want to try out a specially built massage table with a cut-out for the pregnant mother’s belly that will allow her to comfortably lie flat and face down while the SARA 2.0 array is strapped in place. Eswaran said data retrieval for the fetal heart has been strong. Even though the number of sensors has been greatly reduced, the flexibility means the SARA 2.0 sensors can be moved and more precisely targeted for data gathering. Other technologies only can capture the baby’s heart rate, but the SARA can look at the activity in the fetal heart like an electrocardiogram can in an adult. They’ve yet to examine what kind of data can be gathered in regard to fetal brain activity when compared to the original SARA, but the study will not conclude until summer 2019. UAMS also directly contributed some funds to the study.